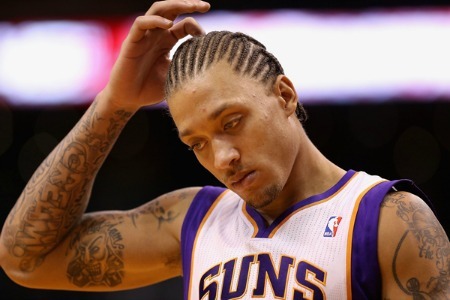 Phoenix Suns forward Michael Beasley (pictured) is under investigation by Scottsdale, Ariz., police for charges related to an alleged sexual assault, according to Sporting News NBA. At this point we can only say the investigation is ongoing, said David Pubins, Scottsdale police spokesman. We are interviewing those involved and processing any physical evidence we may have to try to determine if criminal charges are appropriate. The 24-year-old player has been in trouble with the law before and in the not-so-distant past. Last January, Beasley was reportedly busted by police for speeding; he was clocked at 71 mph in a 45 mph zone. Beasley was reportedly driving a Mercedes that did not have license plates, and he also didn’t have his driver’s license. What’s more, upon inspection of the vehicle, police reportedly stumbled upon a loaded gun. And in 2011 during the NBA lockout, Beasley was cited by police for marijuana possession and for exceeding the speed limit while driving in a Minnesota suburb. Beasley, who is in his fifth season with the Suns, averaged a career low of 10.1 points, 3.8 rebounds, and 1.5 assists. He currently has a three-year contract with the Phoenix team in a deal that was inked last year for a reported $18 million. The sexual assault allegations against Beasley are still under investigation.